The Detroit City Council approved a map earlier today for the City Council districts that will go into effect when we elect a new Council next year. They went with what was commonly known as "Option 3." I was disappointed that they chose not to consider a map that was proposed by Data Driven Detroit, which would have kept neighborhoods together. However, I take comfort in knowing that at least all of the Warrendale neighborhood - both sides of the Southfield Freeway - is together. 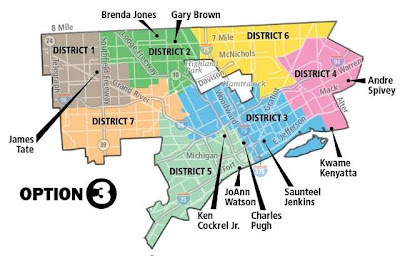 None of the current members of the Detroit City Council live in District 7, which includes the Warrendale neighborhood. This means that we will see someone new represent us, beginning January of 2014.